Supreme Court upholds Arizona redistricting commission. 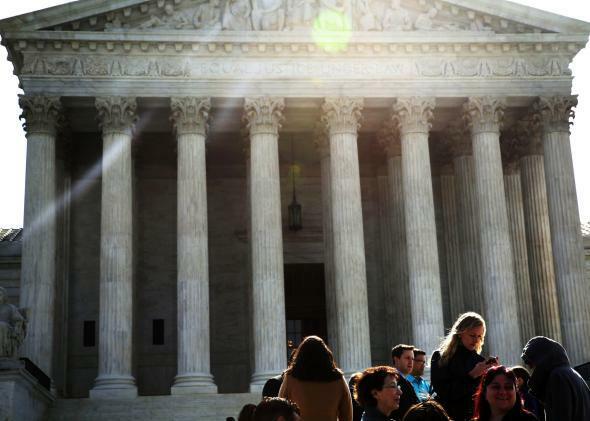 The Supreme Court upheld Arizona’s nonpartisan redistricting commission on Monday. Conservative legislators claim that the independent commission is illegal under Article I, Section 4 of the federal Constitution, which reads, in part: “The times, places and manner of holding elections for … Representatives, shall be prescribed in each state by the legislature thereof.” When the Constitution says “legislature,” these legislators say, it’s talking about them, the elected lawmakers. And any law that affects the “manner of holding elections” for House members without input from the state legislature must be struck down as unconstitutional. But Arizona’s transparently self-interested legislators have a problem. When the Constitution was written, its framers had no concept of initiatives and referenda, which have since become a vital part of the democratic process on the state level. To keep the Constitution relevant and logical, the Supreme Court has repeatedly held that “legislature” actually means legislative power and legislative process—which can, of course, be exercised by the people through direct democracy. The court affirmed this traditional understanding of the Constitution on Monday, holding that “redistricting is a legislative function, to be performed in accordance with the State’s prescriptions for lawmaking, which may include the referendum.” Justice Anthony Kennedy and the three liberals joined Ginsburg’s opinion. Predictably, the four more conservative justices dissented. The ruling saves California’s independent redistricting commission, which is similar to Arizona’s, and wards off partisan gerrymandering in both states.